Optical crystal weight made of pure optical crystal. The paper weights available with us are highly appreciated for their unique designs and color patterns. These crack resistant paper weights are so designed to impart aesthetic look to the table they are kept on. Immortalize those special occasions by capturing them in one of our optical crystal ornaments. 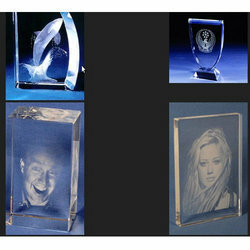 Our artists specially prepare your photo for engraving and then we use sophisticated sub-surface engraving lasers to permanently engrave your photo inside the crystal. Once engraved, your photo will never fade and will provide years of enjoyment and memories! Item code: wctd or description: wired crystal drop colour: clear / natural brass dimension: 2. 5 inch / 7. 5 cm (excluding hanger) material: glass beads, crystal and brass wire more than 90 designs of crystal ornaments are available.